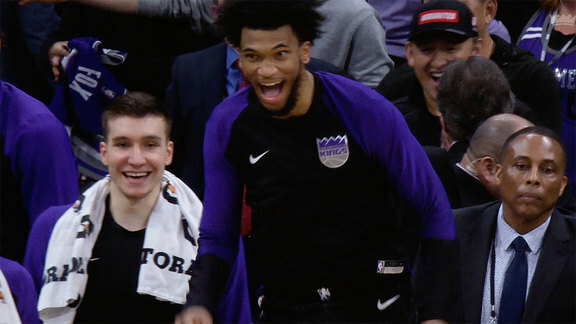 In honor of Black History Month, the Kings organization is highlighting members of the team who have made an impact in their field while also representing their African American heritage. We sat down with Kyle Ellington, our Director of HR and Diversity & Inclusion, who has been with our team for 6 seasons now. Kyle continues to impact our workplace with his leadership and involvement in our happiness and well-being so we wanted to take time to discuss with him his heritage, inspiration and journey. How would you describe your role with the Sacramento Kings? “With the Sacramento Kings, I am the Director of Human Resources and I also focus on diversity and inclusion. With my additional responsibilities as Diversity & Inclusion, I am responsible for making sure we have a diverse and inclusive workplace. I oversee our diversity and inclusion council and organize monthly inclusion events such as our Black History Month panel that we just had." "In Sacramento we are one of the most diverse cities and here at the Sacramento Kings we want to make sure that our community is reflective of our workplace. Everybody is welcome here, diversity includes everyone and I want to make sure that that message is in place with our organization." What would you say you enjoy most about what you do? “What I enjoy most about what I do is the employee experience we provide, for instance we don’t call our employees ‘employees’, we call them team members. I really enjoy seeing our team members have fun at work, and when I see them become super passionate about what they do it makes me love my job even more." In what ways would you say you celebrate your African American heritage? "I think I do that on a day to day basis. As being an African American male and in a director role, there are not too many of us in professional sports. I am always cognizant of that and thinking of what can I do better to pay it back to my community as a whole. " “My dad has been a huge role model of mine. I look up to him because he provided a good life and many opportunities for my family and for myself to go to college and get an education while putting a roof over our heads. My dad is my number one role model." "President Obama is another role model…becoming the first African American President was pretty groundbreaking and inspiring to many African Americans like me that anything is possible through hardwork and perseverance." "And then since I’m a big sports guy, a couple other role models would be Michael Jordan because he’s the GOAT & LeBron James because he has utilized his platform to speak up for social justice throughout his career. " What advice would you give to any fellow African American’s who are striving to succeed in the sports and entertainment industry? “The advice I’d give to anybody whether they’re African American, Hispanic, Asian, white or anyone is that this is a people business. It is all about networking. By building genuine relationships and networks with people, and not just trying to build a relationship with someone to ask for a job from them. Try to build networks and try to get to know people." "If you’re really passionate about working in professional sports you definitely need to have your goals planned and your mission set, and then go and get as much experience in that specific area because it is a competitive business. For example, if you’re really interested in sales, you should be focusing all your effort on sales experiences and sales related jobs and wherever there are internships that can help make sure you can land that full-time job in sales." "The second piece of advice I would give is to take any and all opportunities that you can get to go to career fairs, or opportunities you might have to go network with people. You should find mentors, or ask to shadow people in your community such as your college professor if you’re in a sports management program."